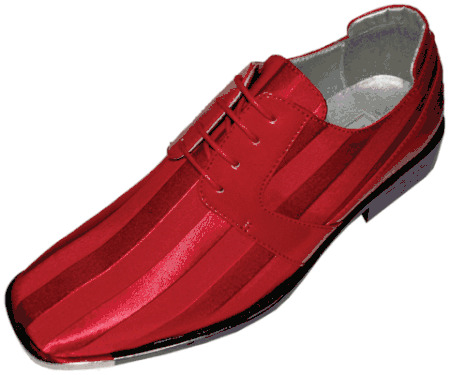 Whether you'll be dancing the night away or you're just going to the Prom, you're going to need some red dress shoes for men and not any old red dress shoes but a pair of these red color satin stripe dress shoes will make an impression that many people won't soon forget. Featuring red tone on tone fabric stripe material that you can match up with our huge collection of satin dress shirts that will hook up beautifully for well put together fashion look. It's not everyday that you're going to wear Red dress shoes but when you need to, doesn't it make you feel good that ContempoSuits.com is right here to supply your fashion color needs. These stylish looking red tuxedo shoes are great for matching up with your satin color dress shirts that will have you looking your very best with your date of the evening or if you're in the Entertainment business, these fashion color shoes will provide you the Maximum Visual Impact you are looking for. If you are new to mens fashion in terms of how to match up a pair of red dress shoes for men, it is alway good to think of combinations. What you need to do is try to combine the color of the dress shirt you are going to wear with the color of your shoes if you are not already wearing a red color suit. Let's say that the color of your suit is black but you want to highlight your attire with red. The best route to go is to wear a pair of red dress shoes with let's say a red satin dress shirt which will make the color red you're wearing literally pop from that black suit that you have hooked up. Put in a red color pocket square in the jacket pocket and you're good to go.